Artbook bundle in the store! OFFHAND now available! Moving sale continues! OFFHAND IS IN THE STORE! And we've added an option for a discounted bundle of both artbooks! We're having a sale! All of our non-print-on-demand items are marked down. Use coupon code MOVINGSALE to get Offhand, Cuttings, and the Cuttings Print Set together for only $40! We're going to be shutting down our store and doing a relaunch in the Spring. If you want anything from us after it's closed, come see us at ECCC or Anime Boston! We're ready to start shipping, so we need everyone to confirm their addresses in PledgeManager! We need you all to do this by January 31st so we can start shipping. There's about 18% of you that have not finished filling out your info right now, so if you can do that by the 31st we can actually get everything out the door. If you do not respond by January 31st we will do another address export on February 28th and catch any late responders at that time. OFFHAND IS IN THE STORE! 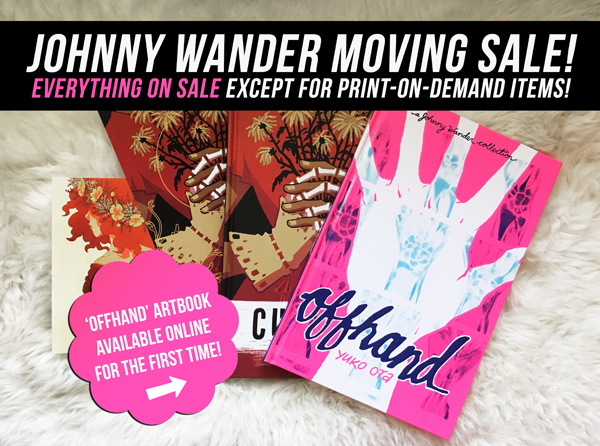 JOHNNY WANDER MOVING SALE! OFFHAND IS IN THE STORE!